Based out of Fort Collins, Colorado, Allegaeon is a metal act blessed with an intelligent sense of melody. The band still brings its death metal chops to the table, but behind the wall of growls and scowls is a divine musical foundation that comes largely because of guitarist Greg Burgess’ classical background. Burgess, along with guitarist Ryan Glisan, forms the core of Allegaeon and makes up the best parts of Formshifter. Vocalist Ezra Haynes is a presence worth paying attention to and bassist Corey Archuleta holds it down, but this record is mostly about the guitars. The band currently finds itself without a drummer, but JP Andrade batters the skins on the album. Haynes’ lyrics help set the band apart from their peers with clever passages about Atlantis, the media and other facets of modern and mythical life. And his classic death metal growl is on-point, even when it does seem repetitive and out of place on some of the more sophisticated tracks. For this writer’s money, however, the lifeblood of the “Colorado Kings of Melodic Death Metal” flows from Burgess and Glisan. Theirs is a pairing that focuses on altering dynamics and shifting gears, flowing from shredding riffs to stunning arcs flawlessly. Burgess’ classical training shines, while Glisan draws things together with uncommon energy. Allegaeon opens Formshifter with a tune that sets up what’s to come. “Behold (God I Am)” digs in with subdued guitar and quickly adds power chords. Haynes’ vocals spiral about, tangling with the stellar riffs and climbing the walls like a demon. “Tartessos: The Hidden Xenocryst,” with its Atlantis narrative, is one of the more adventurous pieces on the album, but Haynes’ vocals begin to feel repetitive. By the time “Iconic Images” kicks in, however, Formshifter becomes less about conventional death metal (vocals and all) and more about creating something special. The track opens with more of the same, but becomes a remarkable piece of work when the bottom drops out and classical guitar emerges from the dark shadows. At first, there’s just a snippet buried in the mix. But by about the 4:20 mark (ha! ), Burgess shines with a Spanish-tinged slice of guitar greatness. The solo is restrained, never excessive, and turns “Iconic Images” into a different piece of work. 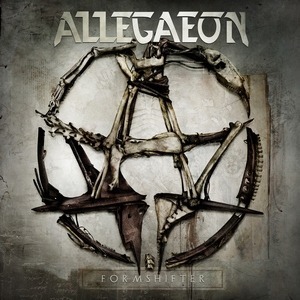 From that glorious moment, it’s back to melodic business as usual as Allegaeon tears through the rest of Formshifter. There are some less than enthralling moments, like the tonally tangled “From the Stars Death Came,” and the vocals are the album’s least stimulating element, but overall this is a pretty good record for fans of classically-kissed shredding.